The Roanoke Valley in Virginia&apos;s Blue Ridge is home to over 300,000 people, making it the largest metropolitan area in Western Virginia and the heart of the Blue Ridge Mountains. 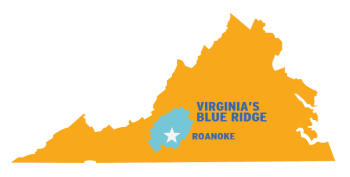 Essentially, Virginia&apos;s Blue Ridge is defined as Roanoke and the surrounding area within an hour radius. This includes the City of Roanoke, City of Salem, Roanoke County, Botetourt County, and Franklin County. Learn more in our section on Cities & Counties in Virginia&apos;s Blue Ridge. From urban delights to small town charm. From front row at the symphony to rugged outdoor recreation. Virginia&apos;s Blue Ridge features countless opportunities for fun and adventure. We hope you&apos;ll stay a few days and explore every corner of this part of Virginia&apos;s mountains. Between the beautiful mountain playground of outdoor amenities and the vibrant metro mix of arts, culture and events, the region features a diverse set of experiences for all ages. Our FAQs page provides answers to our most commonly asked questions, including information about the Roanoke Star, why the mountains are blue, and whether or not we&apos;re connected to the "Lost Colony of Roanoke." If you&apos;re considering relocating to Virginia&apos;s Blue Ridge, our section on Relocation provides great resources about why the region is the perfect place for you and your family. The following sections will help you become more familiar with Virginia&apos;s Blue Ridge.